A working progress...not ashamed to share! I finally picked one! It took me forever to make a decision on a blog ad but here it is. Thank you for all of your input - - it always makes me smile. Do you like it? See this scrumptious picture above? This is what's called an Eggs Benedict. Hand down, my all-time favorite breakfast. Do you have a go-to entree when going to breakfast joint? Well, this is definitely mine and it comes at a whopping 553 calories according to Livestrong.com. Why did I check that? Apparently, I like to torture myself but more importantly, motivate me to work it out and eat healthy 90% of the time. Hey, it's okay to cheat! Just not all the time! Which brings me to the next picture.. Although not my favorite breakfast, it really does get the job done. This makes for a great healthy meal replacement or protein shake to get your nutrients/vitamins in. I love that my protein shake has greens in it because it can be challenging eating salads all day long. 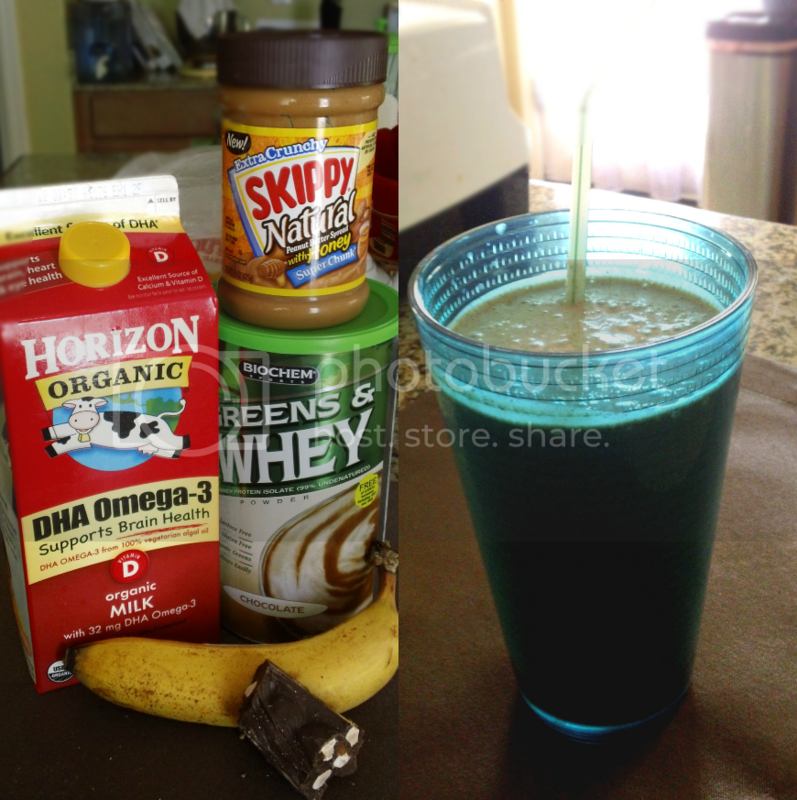 Ingredients: 2 scoops protein powder, 1 ripe banana, 1/4 of a dark chocolate bar w/ almonds, 1 tbsp peanut butter, 6-8 oz. of 2% milk (I love almond milk too), and about 6 ice cubes (more if you like the milkshake consistency). I was a bit hesitant about posting this picture up but at the same time, I want to share with you my progress! My fitness and health goals mean a lot to me. I'm proud that I have finally gotten myself into a solid workout routine as well as eating healthy consistency. I've found that keeping track of the progress is even MORE motivating and will continue doing so. Do you see those biceps??? I can't believe I'm getting there. I'll admit it though...it's not easy. Forcing yourself to commit to the gym at least 5 times a week, an hour each time...it's grueling. But I tell myself that it hurts even more to give up than to keep pushing myself. LOL @ checking LiveStrong. I do the same thing. 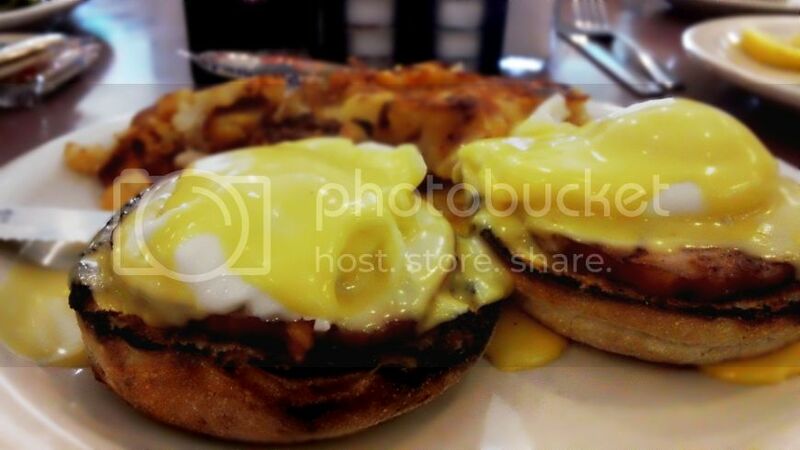 That eggs benedict looks insanely good! I had to!! :) It helps me to stay conscious of what I'm putting into my body haha! Dang, girl, those muscles are fierce! Awesome job! I"ve been working out at that same frequency, and I'm loving it now (didn't when I started...XD). Don't they? They tasted perfect! Thank you for the nice words Meg! Oh. My. Goodness. Those eggs benedict look fantastic! And! That's one of my favorite "fancy" breakfasts! Dang girl, thats awesome. I am now following you! Aww thanks Diana :) You're a sweetheart! Absolutely Kelly! And thank you for the comment and visit :) See you around!! It was almost too yummy hah! Thank you! wow... is that indeed true? almost 600 calories for eggs benedict! I will think twice the next time i am about to order my brunch choice. and 5 times a week for one hour! that is admirable! keep it up! i try to go 3 times a week on my lunch breaks (this week i've been super busy though). Super true. Wished that it wasn't lol! Going 3 times a week is great too! Keep it going, you'll love it! Better get a bandaid, cause you're cut! Heehee... Lookin good girl- super jealous of those guns!! Ohhhhhhh!!! Hah! Love that comment!! Thank you, it was hard work and it's going to get even more ripped! hah! Love the blog ad you've chosen. Well done on all your fitness progress! You're in great shape. Recently I have been getting back into cardio. To keep me going I just make sure that the workout is not too hard (at a bearable pace) and whilst I'm watching my favourite TV shows, time really flies. Thanks Miss K for your input! I appreciate your support so much! I love going to my boyfriend's gym because the tv is hooked up to all of the cardio machines. It really does make the time fly by! Right right??? Super awesome brunch. You can find motivation in most everything to work out. Thanks Angie! I'm tempted to order it again this week...but will have to wait for my next cheat day! hehe! Ahhh, I'm so buckling down when I get back from my travels and doing THIS. Amazing, nice work! Thanks for stopping by Candice! After all of that fancy traveling, it'll be nice to get back into a workout routine :) Thank you for the support! That shake looks awesome! I m glad you posted your pic, you go girlfriend those arms rock! I do yoga daily with my kids which has become a routine and I m on the atkins diet which is hard because I still have to make reg food for my family but I just constantly remind myself how far I ve come and how hard I ve.worked. Also I downloaded a free app on my phone call My Fitness App you can keep track of your food, excersise, and it graphs your progress! I also love that you can scan the bar code on your food to see and track its dietary info! Those eggs benedict look delicious! I ate it up pretty quickly! Lol! Glad you put the pic up of you! You motivate me! Love your blog! Newest follower!!! Would love for you to follow back! ?